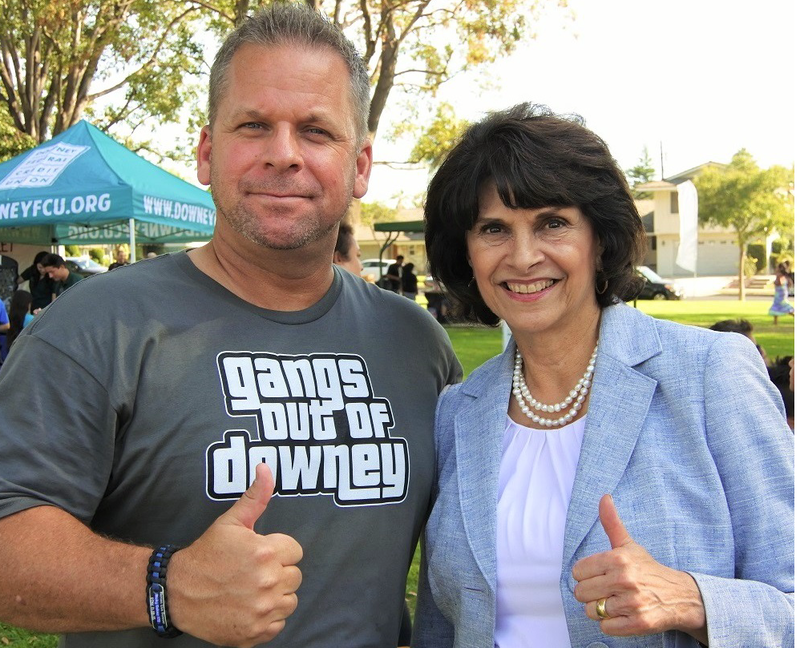 Congresswoman Lucille Roybal-Allard meets with Gangs Out of Downey President and Downey Police Lt. Mark McDaniel, who is wearing Gangs Out of Downey’s new t-shirt and logo. Saturday afternoon G.O.O.D. joined forces with the Downey Parks and Recreation department to co-sponsor the first annual community backpack giveaway and the fourth annual ‘Golden Park Summer Music & Movie Night’. This is the first year of collaboration and it was a tremendous success. G.O.O.D. approached the City wanting to sponsor a city-wide barbeque and backpack / school supplies giveaway, while Grocery Outlet sponsored the 500 hotdogs and 500 hamburgers that were made available free of charge to all in attendance. G.O.O.D. handed out 250 back packs, notebooks, rulers, pencils, erasers, and water bottles to Downey kids. Local businesses set up game and informational booths and as a special treat, hand signed baseball cards and biographies were autographed by baseball major leaguers Jim Campanis- pitcher for the Dodgers; Darrell Jackson – Twins pitcher and former center fielder for the Houston Astros Ken Landreaux. Gangs Out of Downey membership is comprised of volunteers from the Downey Police Department, LA Superior Court, Probation officers, Civic groups, local media, elected officials and local residents who want to keep Downey safe and gang free. The organization purchased the backpacks and additional school supplies were donated by Downey Federal Credit Union, Grocery Outlet / Downey, Kiwanis and Century 21. The final count for backpacks was over 230 with more than 700 people attending the cookout. If you would like to learn more or donate additional supplies please contact Lieutenant Mark McDaniel through the Downey Police Department at 562.833.0348. “We don’t want any kid to have to start a new school year, lacking in basic supplies,” adds McDaniel.